Brand the reader apps to your own logo and name, in addition to controlling the look and feel. OpenPage is committed to ensuring that content can be consumed by all, regardless of the device they are using, or their connection speed. All our reader applications comply with the accessibility guidelines set out in Section 508 of the Rehabilitation Act. At the same time, OpenPage is also compliant with WCAG Level AA accessibility standards. Internet or no internet, there’s no stopping you! Keep learning and working, even when there is no network access. Whether you read on your smartphone or on your laptop, all your data is saved and synchronized the moment network connectivity is regained. The text-to-speech feature reads aloud the text from the content while highlighting the words as they are being read out. Perfect for learning on the go! OpenPage come with a social framework that facilitates a collaborative learning experience by allowing learners and instructors to share annotations, follow users and track content related activities through activity feeds. Capture your thoughts and ideas with our range of built-in annotation tools. 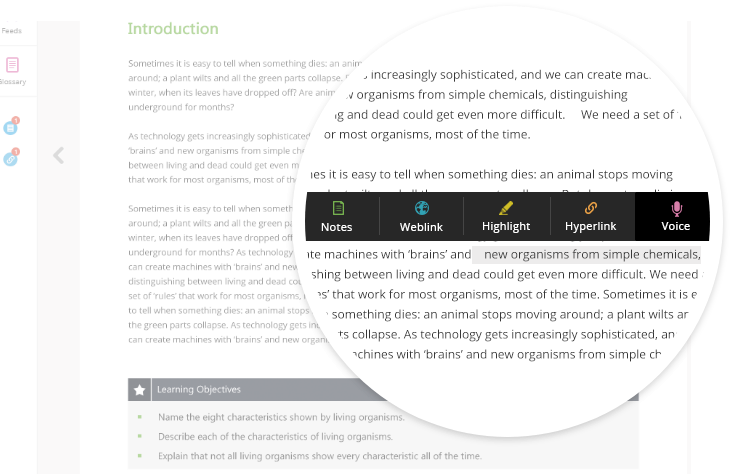 Create a text or a voice note, highlight content in different colours, add weblinks for reference or hyperlink topics. What are the various OpenPage Reader apps available? Is a desktop App available? OpenPage enables users to access content on Windows, Mac, Linux based desktop and laptop computers through the Web Reader and native desktop applications. Native reader apps are available for iOS and Android based tablets and smartphone devices. Users can also use the Web Reader on their tablets. As mentioned above, OpenPage Readers include native desktop applications for Windows, Mac, Linux based desktop and laptop computers. Does OpenPage support reading on mobile devices? Yes, OpenPage includes native iOS and Android applications to enable the same great learning experience on smartphones and tablet devices. What iOS, Android versions are supported by the apps? Does OpenPage support offline reading? Yes. OpenPage’s native desktop and mobile apps enable users to access content both online and offline. All data generated during offline use gets synchronized across all devices whenever any device in use gets connected to the internet. What ebook layouts are supported by OpenPage? What ebook formats are supported by OpenPage? Can OpenPage Reader Apps be branded / white labelled? Yes. OpenPage is a white label solution and all our customers rebrand the platform as per their branding requirements. OpenPage allows you to completely define the look and feel of the reader apps. What are the various annotation options available on the Reader for interaction with text? Text Notes: Users can create, edit, save and delete text notes. Web links: Users can add links to any web resource. Hyperlinks: Users can hyperlink content to any other topic within the same book as well as to any topic within any other book that the user has access to. Voice Notes: Users can record their voice and save it as a note. Is there a glossary available on the reader apps? Yes. OpenPage Readers include a glossary section that contains all words along with their explanation. Explanations can also be supported with multimedia assets. All words included in the glossary (wherever they appear in the content) are hyperlinked to their explanation. Users can click on a word in the main ebook content to view the explanation in a small pop-up. Alternatively, they can go the glossary section to view the complete set of words. Is text-to-speech supported on the Readers? Yes. OpenPage has an in-built text-to-speech functionality on the Readers. What collaboration tools are available? OpenPage provides tools for teachers and students to engage with each other. Teachers can create groups, add members and share specific content including annotations and support with groups. Is page nav supported by OpenPage? Yes. OpenPage supports the page nav specification. Are the readers accessible for differently abled?